For fighter info, see Pit (SSBB), Pit (SSB4) and Pit (SSBU). Official artwork of Pit from Kid Icarus: Uprising. His modern design made its debut in Super Smash Bros. Brawl, and was used again for Uprising. 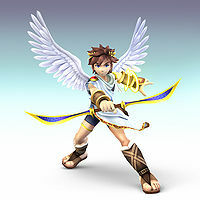 Pit (ピット, Pit) is the main protagonist of the Kid Icarus series. Artwork of Pit from Kid Icarus, the basis of his trophy in Melee. Pit is an angel from Angel Land. His wings are only strong enough to fly for short distances, unless he uses the Wings of Pegasus. Taking up his sacred bow to stop the dark goddess Medusa after she attacked his home of Skyworld and imprisoned Palutena, he set out to gather the Three Sacred Treasures: the Light Arrow, the Mirror Shield, and the Wings of Pegasus. Fighting his way through the Underworld, Overworld and Skyworld, Pit was able to gather the three treasures and defeat Medusa, ending her threat. Pit reappeared again in Kid Icarus: Of Myths and Monsters for the Game Boy, which served as the only sequel in his series for nearly twenty years. In this game, Pit was sent to train and gather the Three Sacred Treasures again so that he could defeat a demonic monster called Orcos. This game went largely unnoticed, partially due to the fact that it was not released in Japan until 2012 via the Virtual Console. 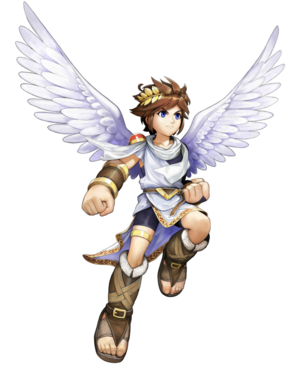 However, aspects of Pit's design that were introduced in this game, such as his redesigned blue eyes, brown hair, and laurel crown, as well as the design of the series' logo, made reappearances years later in Super Smash Bros. Brawl. Due to all of this, Of Myths and Monsters is considered canon. Pit was given a significant redesign for his inclusion in Brawl. Masahiro Sakurai attempted to design him as if the Kid Icarus series had continued, with minor changes adding up to become a big change, in analogy to the various design changes that had happened to Link over the course of the many games of The Legend of Zelda series. 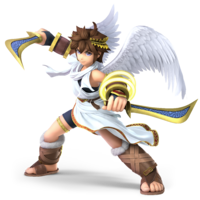 Following a surge of fan interest in the series due to Pit's appearance as a playable character in Brawl, Pit appeared again in Kid Icarus: Uprising, a sequel for the Nintendo 3DS which was released on March 23, 2012 and was also directed by Sakurai. Pit's design in this game is taken directly from his redesign as featured in Brawl. In this game, Pit can't fly at all, and is once again tasked with defeating Medusa, who has been revived, and her army of monsters from the Underworld, along with numerous other foes. After Chapter 9, it is revealed that Hades was actually behind all the havoc caused, using Medusa as a puppet leader. After many brutal encounters, Hades is finally defeated, leaving only his voice and soul to dwell. Pit does not appear in the original Super Smash Bros. in any capacity. A popular rumor though claims he was planned to be playable in the game along with Bowser, King Dedede, Mewtwo, and many other characters, before being cut for space/time constraints. However, unlike the aforementioned three characters, no definitive official source has ever been found that proves Pit was ever planned to be included as a playable character. Pit appears as a collectible trophy within Super Smash Bros. Melee. It can be collected on the Snag the Trophies Bonus Stage, the All-Star Rest Area, and side-scrolling Adventure Mode stages. The trophy features Pit's older design from games predating Brawl, although it features body proportions that are closer to his modern design. While Brawl was still several years away, a note which some believe to be foreshadowing of his appearance as a playable character in the next game is found in his Melee trophy: his trophy info cryptically asks, "Will Pit ever fight again?". The head of Palutena's personal bodyguards, Pit traveled near and far to gather Three Sacred Treasures that would help him defeat the evil goddess of darkness, Medusa, and free Palutena, the goddess of light. Pit couldn't fly with his little wings; only the Wings of Icarus let him take flight. Will Pit ever fight again? Pit as he appears in Super Smash Bros. Brawl. Pit appears as a new playable character in Super Smash Bros. Brawl. He has been heavily redesigned from his original appearance and Melee Trophy, taking on more realistic proportions and is overall much more elegant. He is seen using all three of the Sacred Treasures from Kid Icarus as his neutral special move, up special move, and down special move, albeit with changes from the original game. He is also seen splitting the Palutena Bow into two sharp blades for his standard attacks, something that was not done in any previous game in the series. His Final Smash is Palutena's Army, where he calls on Palutena to send her army of angel centurions against the other characters. Pit is currently ranked 17th on the tier list in C tier. 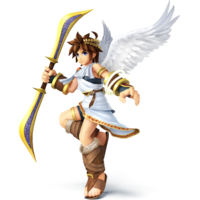 The design created for Pit in this game is used in the third game in the Kid Icarus series, Kid Icarus: Uprising, which largely owes its existence to Pit's appearance in Brawl. The captain of the royal bodyguards of Palutena, Goddess of Light and ruler of Angel Land. The dark goddess, Medusa, conquered the underworld, the surface world and the heavens, then imprisoned Palutena. Pit escaped and, armed with Palutena's magical bow, set out to free her. Along the way, he gathered Three Sacred Treasures with which he challenged Medusa. Pit as he appears in Super Smash Bros. 4. Pit returns as a playable character. His design is that from Kid Icarus: Uprising, itself a slight refinement of his Brawl redesign. He now has moves that use the Upperdash Arm to knock enemies into the air and Guardian Orbitars to erect shields of energy on both sides of him. Both the Upperdash Arm and Guardian Orbitars are weapons from Kid Icarus: Uprising. Pit is tied with Dark Pit for 32nd/33rd place out of 55 on the tier list for Smash 4, placing within the D tier. His recovery, while still long-distanced, was made weaker due to the loss of gliding, as well as his jumps gaining less height. He was also nerfed in regards to damage, start-up and ending lag. However, some of his attacks were given more knockback, granting Pit improved KO power compared to Brawl. While seen as a respectable choice for tournament play, Pit currently has a relatively small player base. Pit is the captain of Palutena's royal guard. Despite the wings on his back, Pit needs the Power of Flight from Palutena in order to truly fly. In Smash Bros., he can still get more air than most, with four jumps and a special move that boosts him higher. He has a new reflect move—it protects both sides! Despite being an angel with wings and all that jazz, Pit can't fly without a little bit of help from his favourite goddess, Palutena. In this game, he's good at both close and ranged combat, and can even deflect projectiles. On top of that, with a high-flying up special and the ability to jump four times in mid-air. he's also got great recovery skills. Pit's side special Upperdash Arm delivers an uppercut so strong, it can send foes flying for a KO. If you miss and fall off the stage, Pit's up special can bring him soaring back. Another of Pit's specials is Palutena Bow, which fires arrows Pit can aim even after they've left the bow. Pit's Upperdash Arm special launches him forwards to strike with an uppercut. It's so powerful, it can deliver an instant KO! If you accidentally dash off the stage with it, one of his up special will get you back on easily. His Palutena Bow special can be charged up, shot straight up into the air, and you can even guide the arrows mid-flight! Let's squash a misconception right now— there is nothing worse than being turned into an eggplant. Just lettuce tell you, being hit by an eggplant bomb is humiliating. It leafs you without mushroom to maneuver and also makes you the laughing stalk of your friends. The powerful treasures used to defeat Medusa, the Three Sacred Treasures include the Arrow of Light, Wings of Pegasus, and Mirror Shield. That reminds me of a bit of trivia: there are in real life Three Sacred Treasures in Japan, but they are a sword, a mirror, and a jewel. These treasures, once used to defeat Medusa, are the Arrow of Light, the Wings of Pegasus and the Mirror Shield. And now for some trivia: the Imperial Regalia of Japan are also known as the Three Sacred Treasures, but those those three are a sword, a mirror and a jewel. Pit, as he appears in Super Smash Bros. Ultimate. Pit returns as a playable character in Super Smash Bros. Ultimate. Unlike in Brawl and Smash 4, he is an unlockable character rather than a starter character. He kept the same moveset as he did in Smash 4, but his Final Smash has been changed to the Lightning Chariot, where he rides the Lightning Chariot and locks onto opponents on the stage, similar to the Dragoon item. Pit is one of four characters to have appeared since Brawl to have a different Final Smash across every installment; the other three are Zero Suit Samus, King Dedede, and R.O.B.. 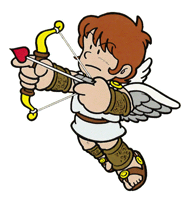 Pit, under the name "Kid Icarus", previously appeared alongside many Nintendo characters in the series Captain N: The Game Master. He was one of the series's main characters, along with Samus Aran (in the comic books) and Mega Man and Simon Belmont (in the TV show). Pit's appearances in Smash 4 and Ultimate, respectively, mark the first times Pit appears alongside Mega Man and Simon in a video game. As of Ultimate, Pit and Dark Pit are the only Kid Icarus characters to retain their English voice from Uprising. This page was last edited on March 30, 2019, at 14:58.